Reece Agnew shields the ball in the match between St Cuthbert Wanderers and Wigtown and Bladnoch. The result of the week was at Stair Park last Saturday where Dumfries YMCA produced a great performance against a young Stranraer FC side to progress in the South Challenge Cup. YMCA are without a victory in the South of Scotland League but saw off their opponents in a penalty shoot out having drawn the match 5-5. YMCA took a two goal lead into the break through a free kick from Jack Jones and a Danny Bryson lob. Stranraer upped their game after the restart and scored three times to take the lead with 15 minutes left to play. Five minutes from the end of the contest Murray Campbell scored to send the match into extra time. In a good open match substitute Mark Wilson put the visitors ahead with a looping shot before the home side equalised once again. Aaron Jardine scored for the Dumfries side from a free kick before the scores were levelled again when Stranraer scored from the penalty spot. In the resultant penalty shoot out YMCA were rewarded for their efforts when they won by four penalties to three. It was first versus second as St Cuthbert Wanderers played host to league leaders Wigtown & Bladnoch. Lowe and Jamieson scored for Wigtown and Donley scored for Saints. Saints can get revenge in the league with a rematch this weekend at Trammondford Park. Creetown also recorded a very good victory at Moffat when they beat Upper Annandale by three goals to one with Gavin Williamson, Robert Smith and Ben Herries scoring the all important goals. Heston Rovers also progressed at the expense of Fleet Star in a narrow 2-1 victory with Jamie Struthers once again finding the net for the home side. Threave Rovers and Newton Stewart played out a 1-1 draw at Meadow Park with the home side securing victory in a penalty shoot out by five goals to four. Mid Annandale beat Nithsdale Wanderers you the odd goal in five at Sanquhar. Dean Smith put the visitors ahead after five minutes play but Nithsdale hit back to take a half time lead with Lori Johnson finding the net in the 14th minute and Kevin Roy after 29 minutes. Connor Graham levelled the contest six minutes after the restart to send the match into extra time when Graham scored the winner for Mids. 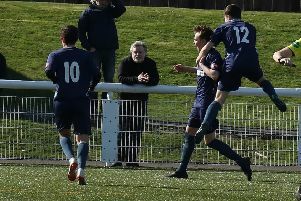 On Friday evening Dalbeattie Star saw off a young Annan Athletic side in a three goals to one victory with Tommy Muir scoring a goal in each half and Anderson scoring the third. Ribeiro scored what proved to be a consolation goal for Annan on the half hour mark.